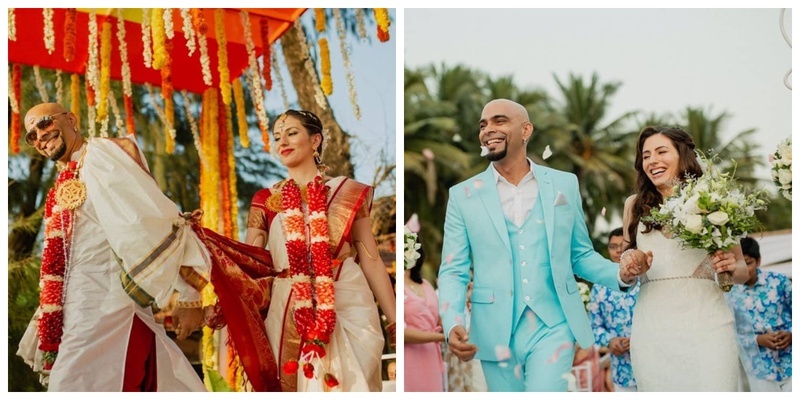 Raghu Ram tied the knot with Natalie Di Luccio in a dreamy wedding ceremony and you've got to check out the pics! Raghu Ram - the name that the entire MTV watching generation can’t shake off, the mastermind behind the longest running shows of the Indian television, Roadies and Splitsvilla recently tied the knot in a serene beach wedding and I am in love with the pictures. Raghu tied the knot with Natalie Di Luccio, an Italian-Canadian singer on 12th December 2018 which was attended by many television celebrities including everyone’s favourite, Ranvijay Singh (at least mine). Raghu proposed to Natalie on 4th March 2018 while the duo were in South Africa, doing the whole shabang of going down on one knee and his lady-love said “yes”! The couple threw an intimate engagement party for their friends back in Canada. The couple’s vibrant personalities were highlighted in their wedding card and I am loving it! The couple had a beach mehendi and from the looks of it, they had a good time at it.